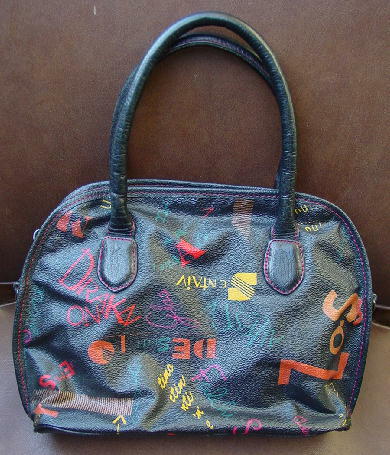 This vinyl Falchi Sport purse has a modified doctor's bag styling in black with various words and shapes in red, orange, maize, teal, and light cocoa. 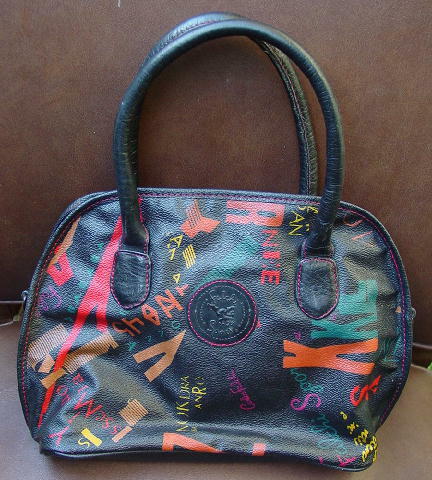 It has two rounded, padded 16" long handles and a top side to side zipper. There is a nice soft black lining with an interior zippered deep pocket with a cloth logo patch below the interior zipper. There are metal loops for a shoulder strap, but there is no strap. It's from a Chicago model.